Interested in monitoring IBM MQ with Dynatrace? The quickest way to get started is to reach out to Dynatrace One. See the current version here. Alternatively, you can search the IBM website for the MQ client version download that matches your environment. For Windows, install the MQ client as specified. Note that for Linux-based ActiveGates, you only need to install MQSeriesRuntime.rpm and MQSeriesClient.rpm. Add the MQ client lib64 libraries to LD PATH by creating a new file in /etc/ld.so.conf.d/. Enter a line that points to the lib64 libraries. The default is /opt/mqm/lib64. Save and restart the LD configuration with sudo ldconfig. Obtain the install files (linux.custom.remote.python.ibmmq.zip and windows.custom.remote.python.ibmmq.zip). Don&apos;t rename the files. Depending on the OS that your ActiveGate runs on, unzip either linux.custom.remote.python.ibmmq.zip or windows.custom.remote.python.ibmmq.zip to the plugin_deployment directory of your ActiveGate host. If the resulting directory structure isn&apos;t either .\plugin_deployment\linux.custom.remote.python.ibmmq\ or .\plugin_deployment\windows.custom.remote.python.ibmmq\, please make the neccessary changes. Click the Upload plugin button and upload the zipped file. User: The username for connecting to the IBM MQ instance. Two key repositories must exist - one on the ActiveGate where the MQ Client resides, and the other on the IBM MQ server. Each repository must have the other’s public key certificate. The certificate label of the MQ Server must be ibmwebspheremq<queue_manager>(all lowercase). The certificate label of the MQ Client on the ActiveGate must be ibmwebspheremq<username> (all lowercase). The username is the account through which the Remote Plugin process runs. 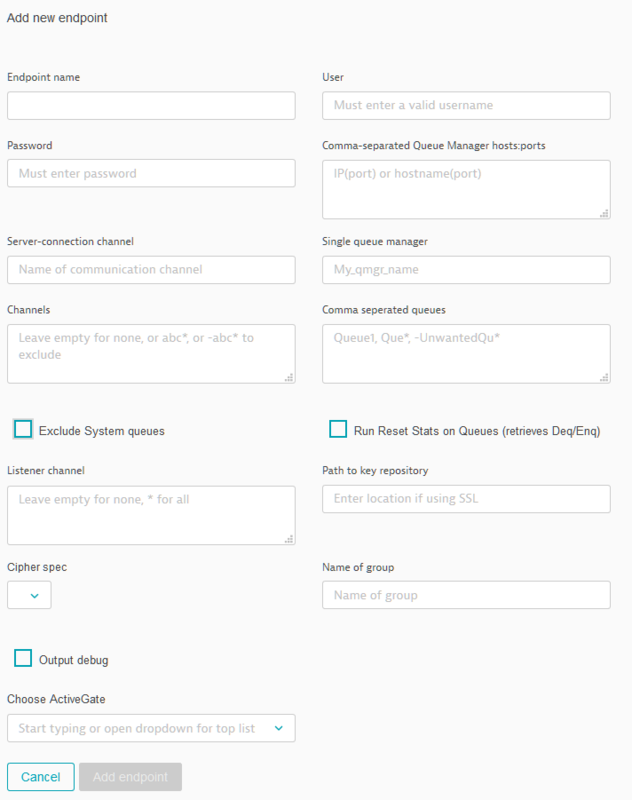 Name of group: If queue manager is part of a cluster, type the name here to group in the GUI. Output debug: Only enable if requested by Dynatrace.